I had dreamt about taking a trip to Portugal long before I actually got to visit. When I spoke with people about my plans, the response I often got was that Portugal with a toddler seemed like it would be difficult with the hills and the cliffs. Not only was it not difficult, but it was one of the best and easiest trips I have ever taken, which is saying a lot given that I was traveling alone with a 2-year-old! We based our vacation out of Cascais, on the coast roughly 20 miles west of Lisbon, which was the perfect spot to explore with young kids and would be a great base for families with older kids as well. The draws of this beautiful town are its rich and interesting past, pedestrian-friendly center, sandy beaches and ideal location. Cascais, originally one of Portugal’s largest port towns, is the place that started the beach tourism boom when King Luis I chose it as his summer home. Our wonderful tour guide, Andre, regaled us with stories of kings and queens on summer holiday in the area. If 20th-century history is more your style, you will love learning about the WWII events that took place here. Since Portugal was neutral, the Cascais/Estoril area was often a meeting point for spies to trade secrets. James Bond wrote Casino Royale in Cascais, and many of the stories he tells were inspired by personal experiences in the area. Cascais and its surroundings combine for an outstanding family holiday. You can explore the Museum Quarter with one ticket. Museu Condes de Castro Guimarães was our personal favorite; the architecture and details of the building are beautiful. The biggest draw of this museum with young kids? The gardens. You could spend a full day enjoying the green space — kids will love running around playing with the peacocks and chickens that reside there. The town itself is charming and friendly, large enough to fill days of exploration and small enough to enjoy on foot. Its pedestrian square is tiled to look like the waves of the ocean and the streets are lined with shops and restaurants that will make any wayfarer happy. The flat streets are incredibly walkable, even with a stroller! Seafood lovers will rejoice in the local cuisine, but those a little weary of eating fish every day have plenty of alternatives. A famous hot-dog stand (Roulote Hot Dogs Cascais) sits on the coastline, appealing to young travelers and foodie parents alike. There are great dining options with incredible views and outdoor seating for relaxed meals. Just make sure you leave room for dessert: Grab a buttery, flaky pastéis de nata (custard tart) from NATA Lisboa or gelato from Santini’s (the very same spot you may have found an exiled king enjoying a frozen treat during WWII). Cascais has multiple stretches of beautiful, sandy shoreline — some with outstanding waves for surf lessons, others with calm water perfect for new swimmers. Most are simple for families with young children to access (read: you don’t have to go down 100 steps while balancing your gear to get to them). Guincho Beach is just north of the city, and easy to pair with a stop at Cabo Raso (the most western point in all of Europe). With views of the Sintra mountains, its position makes it one of the windier locations in Cascais. This is fantastic for those who are interested in surfing, and it’s a great beach for families as it doesn’t get quite as crowded in the summer as those nearer the town. It does require a drive or bike ride to reach, and has about 20 steps down to the sand, so it is more appropriate for families with older kids. The nearby footpath makes this a great spot for hikers as well. Conceição and Duquesa Beaches are easily accessible from the town of Cascais. With great views of the architecture, restaurants nearby and tepid waters, these are just right for travelers with toddlers. Father south in Estoril lies Praia do Tamariz. Grab a spot here if you want to beach with a view of the casino that inspired Casino Royale. TIP: If you are visiting in the summer months, arrive early to nab the best spot on your beach of choice. One appealing reason to visit Cascais, especially with younger kids, is its location. It’s just 40 minutes outside of Lisbon by train or car, so you don’t have to travel hours from the airport to enjoy some beach time during your Portugal holiday. Its proximity to Lisbon means you can easily visit this iconic city, but without having to base there. It is wonderful to have a retreat to return to with plenty of space for littles to run around after time in the capital. The magical town of Sintra is also nearby. Here you can visit beautiful palaces, soak in the history of the hilltop fortress or play in the parks that must have inspired a fairy tale or two. Sintra is best explored with a driver and guide — the walk up is steep and winding, and not suited for young kids. Having a driver handy to whisk you from spot to spot makes for an efficient day of exploring this beautiful area. Accessing Cascais has never been easier thanks to TAP Air Portugal’s stopover program. If your long-haul flight has a layover in Lisbon, you can extend the stopover by up to 5 days at no additional fee. TAP Air Portugal has flights originating from all over the world. Even better, they have made the booking process for this stopover user-friendly … it all can be done online. There are a few different areas of Cascais that make a great base for exploring with families. We stayed at Sheraton Cascais Resort, which was perfect for enjoying the area with a toddler. Sheraton Cascais is just outside the main town in a more residential area that is quiet during the day (good for naps! ), and has lots of space within the property. We spent the mornings after breakfast running around the grounds and playing on the playground before heading into town. A huge draw of the resort is the room setup; they have configurations with full kitchens and multiple bedrooms, meaning you have the benefits of staying in a hotel (breakfast, concierge, room service) with the convenience of your own apartment. The property has a climatized pool, but if it is a bit too breezy out to enjoy it (not likely with the mild local weather), there’s an indoor pool in the spa with family hours. My daughter loved playing with the jets and I loved how adorable she looked in the swim cap. The resort also has a fantastic playground area. It is fully staffed during the summer months, which means parents can enjoy a date night while their kids have fun exploring. Service was warm and welcoming. We had a later flight and arranged room service prior to our arrival so we didn’t have to worry about waiting for food while getting settled with a tired and hungry toddler. This was a huge treat and proved that the property understands the needs of traveling families. Martinhal Cascais is similarly located. For families who prefer staying closer to the town center, Pousada Cascais is an interesting property in the Art District. Kids will love that they are staying in an old fortress; parents will love the modern but comfortable rooms. If you want to be closer to the sand, Hotel Albatroz fits the bill. Walking distance from both the beach and the town, the sea view rooms here truly make you feel like you’re on vacation. 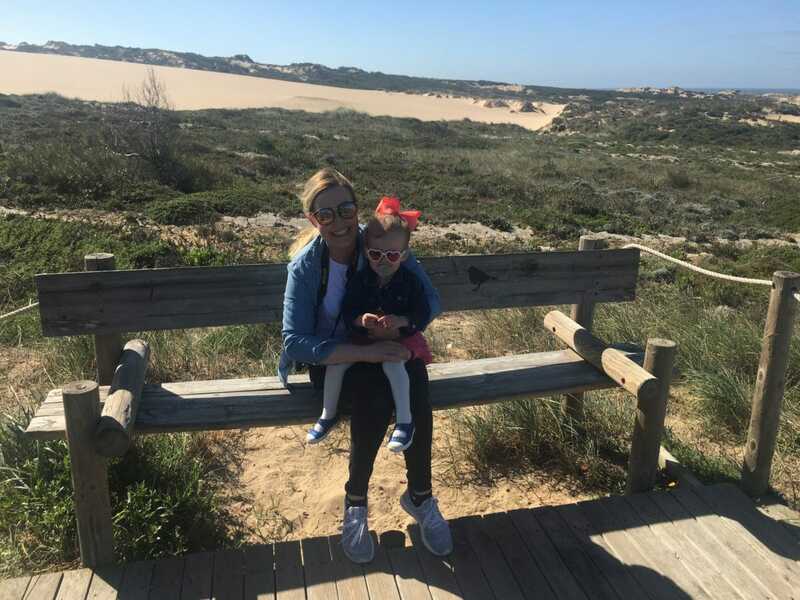 Editor’s Note: Katie received a media package from Visit Cascais in order to review the area and accommodations for families. As always, our opinions are our own on Ciao Bambino. Photos by Katie Brown except where noted.